Bethesda was one of the few third-party publishers to embrace the Switch early and bring over games geared toward older audiences, releasing robust ports of The Elder Scrolls V: Skyrim and the reboot of Doom. 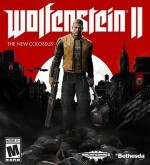 The latest port to join the fray is Wolfenstein II: The New Colossus, a game I adored when it originally released last year. So how does the version designed for Switch stack up? It captures everything that makes this tale of revolution and adventure so satisfying — with only a few compromises to bear. Woflenstein II picks up immediately after the conclusion of the first game. 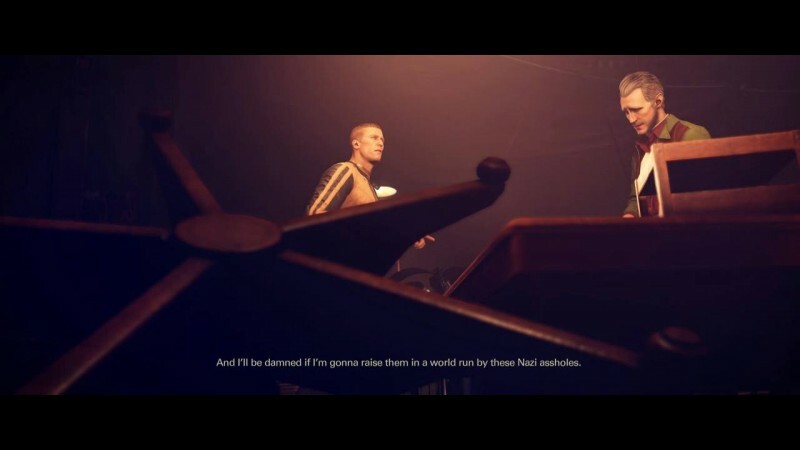 After conquering the evil Dr. Deathshead at a high cost, hero BJ Blazkowicz is crippled and the Kreisau Circle is on the run, trying to keep the revolution alive as the Nazis hunt them. Players are thrown into a strange world where Nazis and the Ku Klux Klan hobnob in the streets of Roswell, and actors board shuttles to fly to planets for auditions in propaganda films. The New Colossus goes all in, offering heartbreak and wild, weird moments in equal measure. One minute, you’re watching a drunk BJ ride a pig through the belly of a U-Boat. Another minute, he is comforting a woman mourning the loss of her husband. Though this mixture of tragedy and insanity might not be for everyone, the powerful concoction makes The New Colossus unlike any other shooter. 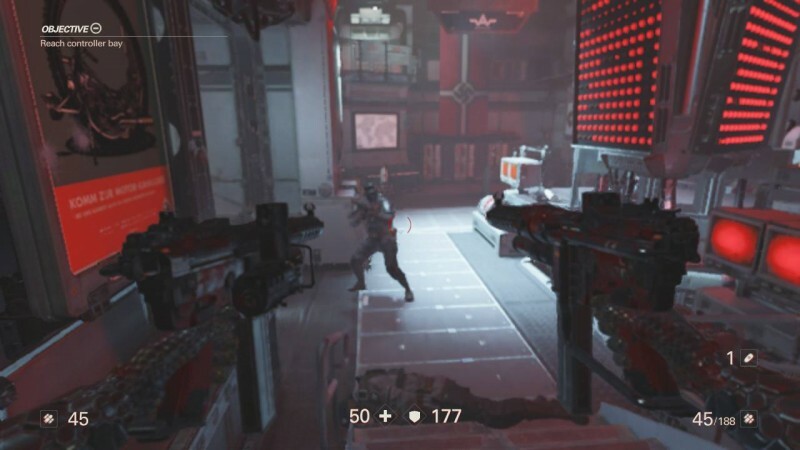 The Switch version of Wolfenstein II is solid no matter which way you choose to play it. The docked version of the game looks the best, nearly 1:1 with the original release. Fuzzy draw distance for larger areas and uglier textures for weapons and enemies are compromises, but they aren’t big ones. Visuals take an even bigger hit on handheld mode, amplifying the issues. 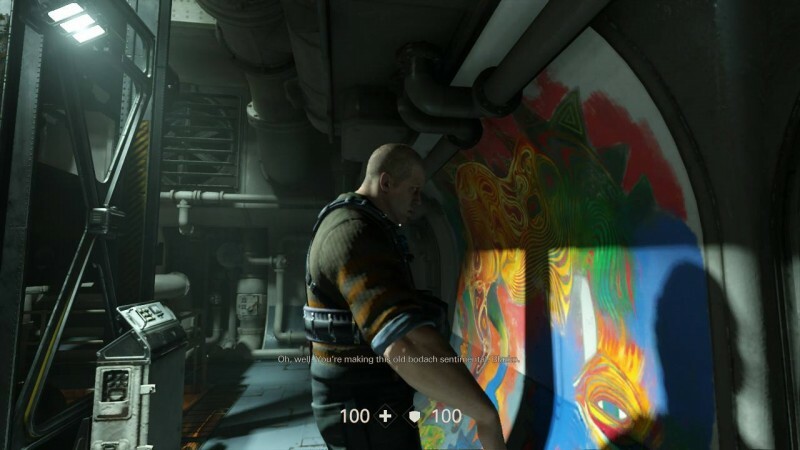 However, even with these graphical downgrades in mind, Wolfenstein II is a fantastic-looking game, especially with regards to art design. Roswell remains a vivid, chilling portrait of a country that’s willingly given its soul to fascism, with all its propaganda art and exaggerated ‘50s-style décor. Firefights are still as intense as ever, with impressive particle effects firing off in every direction, and I never encountered a single framerate slowdown during the whole campaign. 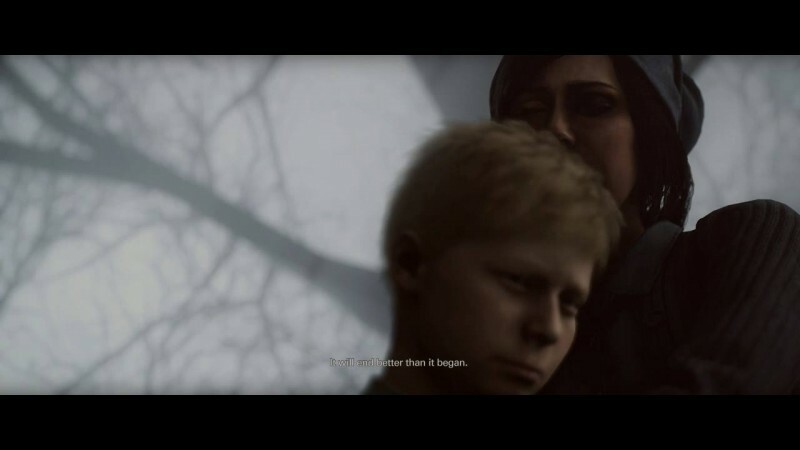 Cutscenes in Wolfenstein II look great, but there are a handful of in-game sequences that have close-ups on characters’ faces that serve as the most egregious visual hit. Luckily, these sequences are few and far between. The New Colossus also plays surprisingly well on the Joy-Cons. The Pro Controller is obviously the way to go if you have one, but the Joy-Cons do an admirable enough job letting you control BJ’s movements both in and out of tense combat situations. I played through the majority of the game in handheld mode using the Joy-Cons, and never felt frustration with the control scheme. 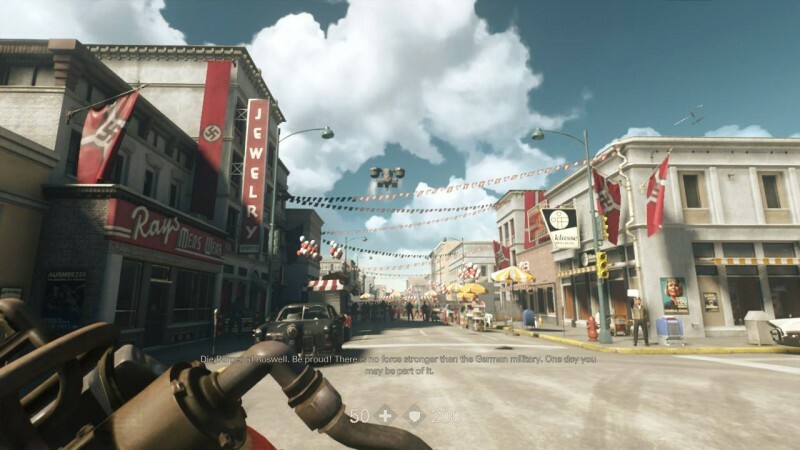 My biggest disappointment with this incarnation of Wolfenstein II is that it only contains content from the original retail release, and doesn’t integrate any post-launch enhancements. That means the combat simulations that were added into the base game are missing (essentially an Arcade Mode where you could replay levels from the game to build scores with bloody Nazi-killing combos), as are quality-of-life updates like a more generous grenade indicator. The Freedom Chronicles DLC is also not included (and there’s no way to buy it). Bethesda says that none of this post-release content is currently planned for the Switch version. 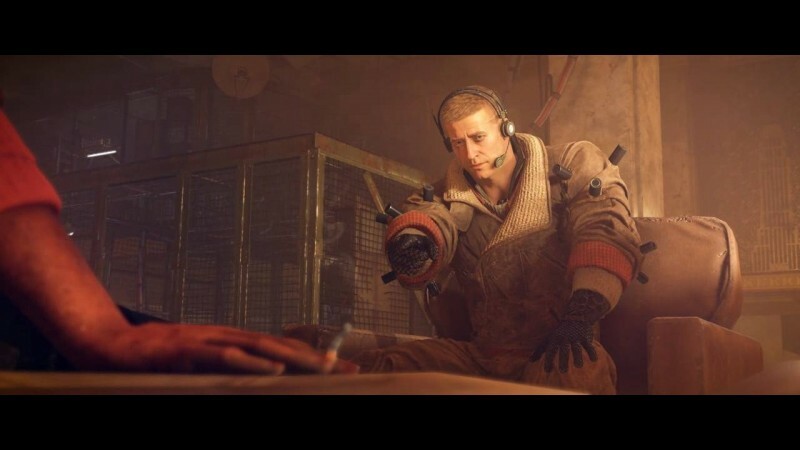 While these components aren’t an essential part of what makes Wolfenstein II so special, leaving them out makes little sense. Expecting a full-priced retail port of a game released last year to include at least some improvements made to other versions is not unreasonable – especially when the Switch ports of both Doom and Skyrim do. 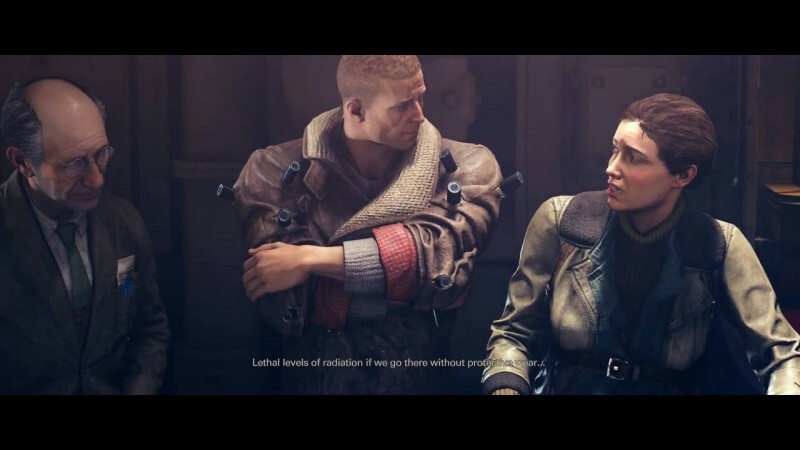 Make no bloody, broken Nazi bones about it: The Switch version is the least visually appealing version of Wolfenstein II. However, for me, that compromise is easy to accept when I can take Machinegames’ opus with me wherever I go. 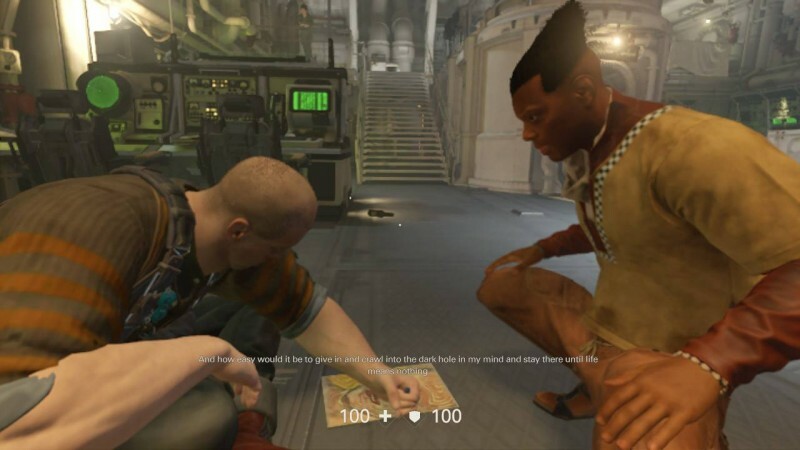 Even the worst version of The New Colossus is an incredible, must-play game for anyone who loves zany action and honest, powerful stories about the cost of hope. 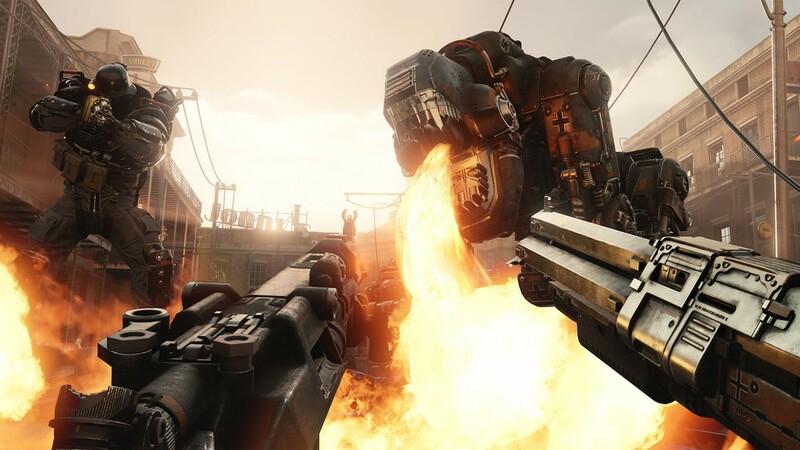 The Switch port of Wolfenstein II retains all the zany action and heartbreak of its console predecessor.